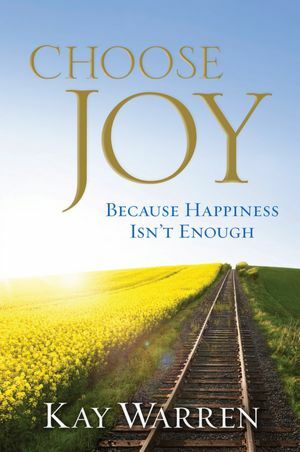 I have just finished reading Kay Warren’s new book, CHOOSE JOY (Because Happiness Isn’t Enough). Kay of course is the wife of Saddleback Church‘s pastor, Rich Warren. Given her role as Rick’s wife one might think Kay had abundant joy in her life but that was not always the case. Kay writes with a transparency that helps the reader identify with circumstances she faced as she looked at how our possessions, positions and personality affect our ability to know joy. Kay shares her own responses to the Jesus Movement and how we often choose self-inflicted rules rather than experiencing the incredible joy the Bible constantly reminds us is readily available. She reveals her own inadequacies and controlling nature as she shares the moments her joy was definitely compromised with the birth of her grandson and even in the moments Rick would share he thought she really didn’t like him! I am a huge fan of JESUS CALLING and particularly enjoyed Kay’s discovery through reading Sarah Young’s devotional how worry is a direct rebellion against God. Kay likens God’s children to pieces of broken stained glass which form no pretty picture when separated but when molded together in His design create an awesome picture! Kay shares her personal triumphs in deliberately choosing joy and asks the readers some insightful questions to help make that change in their own lives. CHOOSE JOY is available as a Bible study as well. So, if you are doing a little soul-searching and looking for a peace, contentment and comfort you can’t find in your life now, I recommend you read CHOOSE JOY and then do just that. This entry was posted in Uncategorized and tagged Bible Study, Book review, Facebook, Saddleback Church, Uncategorized. Bookmark the permalink. Thanks for your comments and likes on my posts Jenna. I really appreciate it!